The WWW Book Club meetings will be held on the Wednesday after regular WWW meetings. The 2019 schedule will be as follows, with meeting places to be announced. 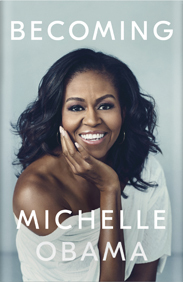 Wed., Feb. 13, 6 p.m.
Wed., March 13, 6 p.m.
Wed., April 10, 6 p.m.
February’s book will be Michelle Obama’s book Becoming. The book club will break for June, July, and August, resuming in September. On Wed., Feb. 13, at 6 p.m., we’ll review Michelle Obama’s best seller Becoming. RSVP with hostess Patricia Smith at pgsmithus@aol.com. We will gather at 1 Riverpointe Plaza, Apt. 720, Jeffersonville, IN 47130. On Wed., March 13, at 6 p.m., we will head to 1965 and the land of Dr. Zhivago by Boris Pasternak. We need a hostess. Please let me know if you are able. We are a small group, and the hostess could coordinate the meeting somewhere besides her house, like a community building, church, or coffee shop. We’ll rub elbows with the wealthy on Wed., April 10, at 6 p.m. Jane Mayer’s Dark Money: The Hidden History of the Billionaires will explain how the war on terror turned into a war on America. Please let me know if you are able to serve as hostess for this meeting. After Derby, on Wed., May 8, at 6 p.m., we’ll settle into The Sixth Extinction: An Unnatural History, by Elizabeth Kolbert. Cheri Powell will hostess at 2100 Tyler Lane, Louisville 40205. RSVP at writing_cheri@yahoo.com. You do not have to read the book to join us. You just have to show up. Come and help us decide what to read in the fall!